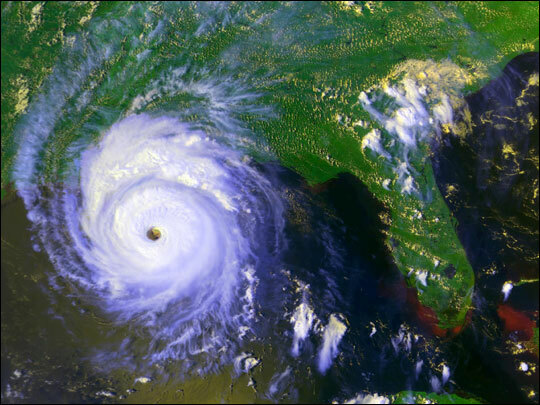 Ten years ago, on the week of August 24th, 1992, Atlantic-born Hurricane Andrew ripped through south Florida, barreled its way northwest across the Gulf of New Mexico, and slammed into Louisiana roughly one hundred miles southwest of New Orleans. Along the way, the Category 5 hurricane gave rise to 18-foot (5.5-meter) storm surges that inundated coastal towns and maximum sustained winds of 165 miles (266 kilometer) per hour that reduced entire neighborhoods to kindling. 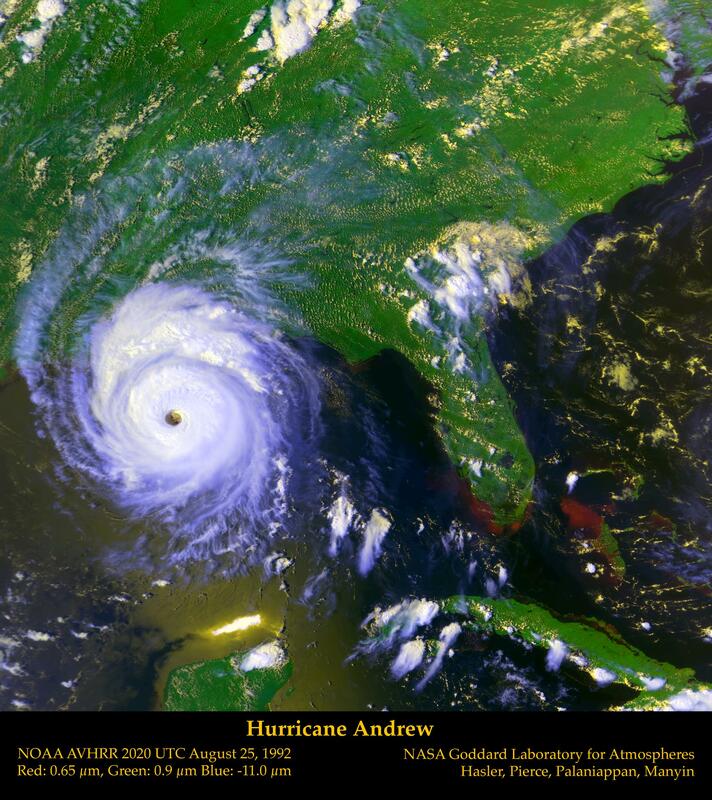 In the end, Andrew resulted in $25 billion in damages (1992 dollars) and more than 60 deaths, directly and indirectly through flooding. The above image of Andrew was taken on August 25, 1992, at 20:20 UT. Looking at the image, one can see Andrew’s path laid out behind it in the form of churned-up, reddish brown ocean sediments and residual cloud cover. Flooding can be seen along the coast of south Florida. The cloud data are from the National Atmospheric and Oceanic Administration's (NOAA) Geostationary Operational Environmental Satellite (GOES), and the vegetation is derived from Advanced Very High Resolution Radiometers (AVHRR) aboard NOAA's operational satellites.